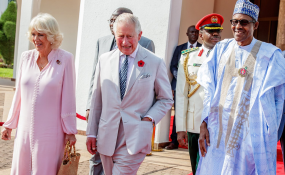 Nigerian monarchs yesterday held a closed-door meeting with Prince Charles at the British High Commissioner's residence in Abuja on Tuesday. Monarchs at the meeting included the Sultan of Sokoto, Muhammad Sa'ad Abubakar; Ooni of Ife, Enitan Ogunwusi; and Obi of Onitsha, Igwe Alfred Achebe. Others are Oba of Benin, Ewuare II; Shehu of Borno, Abubakar Ibn Umar Garbai El-Kanemi; Emir of Kano, Muhammadu Sanusi II; Etsu Nupe Yahaya Abubakar. Ewuare told journalists that issues of Nigeria's security and development, including girl child education, action against human trafficking, among others, were discussed. The Emir of Kano said the meeting also discussed climate change, immigration, demographic explosion, population control and their consequences. He said, "The population of Nigeria today, is four, five times what it was in 1960, we are moving from 45 million to about 200million, we are not looking at the level of desertification, the erosion in Niger Delta, the loss of the reserve in Chad Basin. Basically, there is population explosion and you got diminishing resources." Emir Sanusi said despite the population explosion, Nigerians had not changed the way they built houses. He said everyone wanted a plot of land, and that this had forced the government to convert farmlands to residential areas. Ewuare asked the Prince Charles to support the call for return of ancient Benin artefacts which were taken to the United Kingdom in 1897 by the British authorities. He said the return of the artefacts would enable him to establish Oba Palace Museum for the promotion of tourism in Benin City, Edo State.